Which plicata is it? we had to ask?? I have always grown this Iris as 'Rococo' but......first of all there is that registration colour 'Blue' (just which of the hundreds of blues did they mean?) and as you can see just plain old 'Blue' wasn't in the mix on our plant growing at home.The Schreiner's Catalogue 'Artist enhanced' colour portraits on the cover of their 1960 catalog the blue is almost a Blue Black. Turns out we had it nailed after-all and I guess you could say with help from that 7 year old camera we have captured 'Rococo's' amazing violet-blue colour tones and it's obvious charms for all to see. Its one of the great things about the blog, it changes the need to continuously process identification issues and it's like labelling an iris with a digital indelible pencil. This is a classic in the blue and white plicata's class and is one of the earliest so called modern plicata's to bloom. Tall (103cm) stems at times slightly ziggy zaggy with 3-4 beautifully spaced branches, 7-9 buds, this all helps to produce a powerful display that carries across the garden. Beards are described in the checklist entry as 'inconspicuous' but I like to think they are much more than that, they are a harmonious soft blue-violet colour, tipped orange deep in the heart adding a certain brilliance to the blooms. 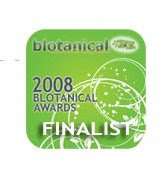 Terrific plant habits,with outstanding growth and an ability to resist adverse weather conditions. 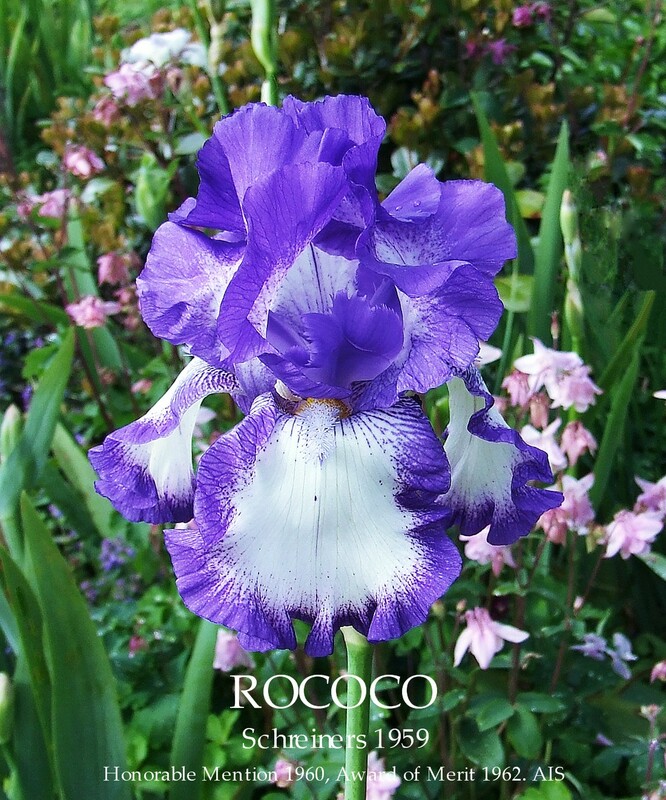 No collection of classic irises is complete without 'Rococo'!!! Just the one bump in the road and that is I just can't seem to find a New Zealand commercial grower that lists 'Rococo' well at least not a 'Rococo' with the correct label but do not fret too much as it is sold on Trade Me occasionally by the odd reputable trader. I remember reading in some 1960's journal a comment that Joe Ghio had made about how the blue plicata's owed so much of their rapid advancement to 'Rococo' and the AIS checklist indicates it was used heavily as a parent. ROCOCO (Schreiner 1960) E. 39"
What a thrilling concept for a hybridizer that beauty should possess an infinite frontier! When beauteous Belle Meade first swam into our ken, it seemed as if a more beautiful blue plicata could not be achieved. But in Rococo we have what is obviously a new ultimate in plicata beauty, never did an iris display such an intricate, saucy, petunia-like frilling. Indeed, in both color and form this is probably the fanciest iris in existence. The snowy ground of both standards and falls, the clean-cut margining of freshest, brightest blue, the classic grace - all suggest the exquisite perfection ascribed to Grecian art. 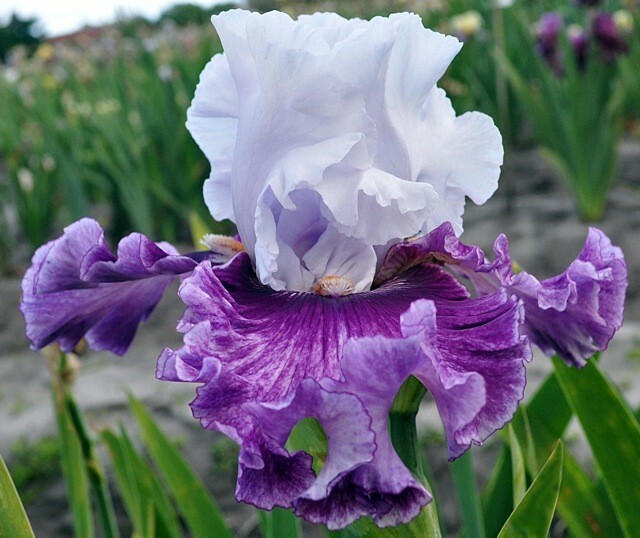 For a new Queen of the iris garden we nominate Rococo. Its beauty will lend prestige to the finest iris collection. Plant patent pending. Region 14 Northern California, Nevada, Regional Bulletin, Spring 1961. Varietal Comment, Virginia Messick, Lafayette, California. ROCOCO (Schreiner '60) was a standout wherever seen at the Portland Convention. It had opened at a perfect time and was strategically located throughout the Schreiner gardens,but I was very impressed with it and voted for it for the Presidents Cup (won by Violet Hills.) Rococo is a blue plicata, very ruffled, fluted and beautifully branched. It apparently can stand adverse weather conditions because it still looked fine in spite of "heavy dew" that was falling. As I remember it, Rococo was a bit more on the purple side than as pictured on the catalog. Varietal Comment, Neva Sexton, Wasco, California. ROCOCO (Schreiner) This is a very white ground plicata. Dark blue markings form a half inch border on the frilled falls. The standards are almost entirely colored with the same blue. This iris will be a challenge to all hybridizers to TOP. The Iris Year Book,(BIS), 1962. ROCOCO (Schriener 1959) This is one of the best irises seen at "Sandilands". It has been described as "the plicata to end all plicatas" and certainly that is likely to be true for many years to come. The colour pattern is deep blue violet on white, for both standards and falls, and the whole flower is heavily ruffled. The branching on the tall spikes (3 feet 6 inches) is excellent with two buds on each of the four branches. Some spikes carried three open flowers others four. The standards were closed in the young flower but tended to opened later. The falls, varying from semi flaring to pendant, were large and spectacular. Whatever may be thought of the departures from classicism on the show bench, ROCOCO will bloom twice as long and will be much more exciting and decorative in the garden than many honoured varieties. (CAROLINE JANE X FLYING SAUCER) X BELLE MEADE. I have included this second entry from the Schreiner's catalogues to show how the colour description changed from brightest blue in 1960 to violet blue in 1965. Another tidbit is that Schreiner's applied for a plant patent for 'ROCOCO' in 1960 and had the Patent #2077 awarded in 1965. Ruffled and fluted, giant plicata of bright blue on clean white, the blue pattern especially wide and heavy in the folds of the standards. The falls are pure white in the center, with a quite distinct band of blue encircling a full halve inch of the pleated and ruffled border. Beard is deep yellow. Much discussed and admired recent novelty. Early; 40 inches. Plant Patent 2077 HM, AIS 1960 AM, 1962. Region 14 Northern California, Nevada, Regional Bulletin, Spring 1966. 1965 Parade of Favorites, Frank Scott. ROCOCO (Schreiner '60) Still a top star in the blue and white plicata class. The flowers are so large and heavily ruffled, they just get you. Rococo has a long bloom period and growth habits seem excellent. ROCOCO (R. Schreiner, R. 1959). Sdlg. O-508-1. TB 39" E. W2B. S. white stitched blue; F. white bordered blue; inconspicuous beard. (Caroline Jane x Flying Saucer) x Belle Meade., Schreiner 1960. HM 1960. A major hat tip to Phil Edinger for his succinct observations. I was approach by a Bookseller to review the book 'A Guide to Bearded Irises: Cultivating the Rainbow for Beginners and Enthusiasts' (2012) by Kelly Norris, this was before the books publication and it was an offer I turned down, the reason, Mr Norris recently became the Editor of the American Iris Society Bulletin so I had become reluctantly used to his media style, this understandably tempered my expectations for substance and possibly not the attitude required for writing a review for a bookseller who expects all the bells and whistles to sell books. However several months ago the same Bookseller offered me this book for a massively discounted price with no strings attached which I accepted. I have held off posting a review of this book but with the 'New Zealand Gardener' magazine coming out in their November 2012 publication with its so called book review is time to have a word. With a listed ticket price of $79.99 I'm not even sure if this is a reasonable price for a 'A great coffee table addition' as one Amazon reviewer suggested, and as I have no idea what coffee table book aficionados require to fill a vacant space on a coffee table I can not say if the book fits this criteria, but I can say fairly and squarely I do not think this is a book of good value or importance to New Zealand Iris growers no matter what their status. The style of writing is pretentious in a elitist witticism style which the publisher in their blurb consider humorous but after a couple of pages becomes tiresome, includes more than a few puzzling and unsubstantiated statements and with 300 or so colour photos that vary in quality the book could hardly be called comprehensive and to be frank there is just as much if not more information in a Schreiner's Iris catalogue ($5.00) . The book has all the appearances of being rushed into print. In the 'Red' colour section the author goes on to reference Louisians and I.fulva which is a surprise as the Book title states the scope of the book is limited to the bearded irises so this has the reader scrambling for another more authoritative book on Irises to try and understand what the writer is on about. 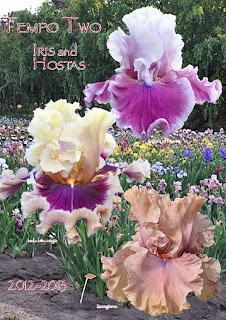 For New Zealand gardeners starting to find their feet in Iris growing this would be the one purchase not to buy, a good proportion of Bearded Irises listed are not available here, its gardening advise is written for North American gardeners and the books selective criteria covers only bearded iris varieties, also listing only commercial sources in North America. All of this would only lead to the reader especially if they are new to the iris world thinking that there is only a limited selection available in New Zealand. If you have $80.00 to spend on a iris hobby my advise is send away for an Iris catalogue from a New Zealand commercial iris grower which will cost you anywhere between the price of a few postage stamps to $6.00. These catalogues normally contain good but brief growing information that suit the New Zealand growing conditions and for the $74.00 balance use the money to purchase your Iris plant selections from the catalogues. If you want a real Iris book for the same approximate monetary value buy Clarie Austins 'Irises, A Gardeners Encyclopedia' reads well, without doubt much more comprehensive and covers the majority of the all popular Iris species and hybrids. After reading the above and you still think you really need this book and you have half an hour to spare check out 'A Guide to Bearded Irises' first at a library if they have it, a quick flick through this book could save you a lot of money. To the publisher Timber Press,'What were you thinking'?? if you are going to build a publication on the cult of the personality, you run the risk of irritating everybody outside the smallish targeted so called Hip gardeners demographic and why is your recommended retail price in New Zealand so high when this book only months after its release is already been flogged off with the price heavily discounted internationally?? The glowing review of this book in the 'New Zealand Gardener' magazine is just a cut and paste job from the publishers blurb and has all the appearance of reviewing the book without actually reading it. So brilliantly researched the reviewer couldn't even get the gender of the author correct. 'New Books' then goes on to review the book 'Garden Tours. A Visitor’s Guide to 50 Top New Zealand Gardens' by Michele Hickman' which it is said the author never visited the gardens but implied she did. Visit http://thinkingardens.co.uk/articles/an-interesting-book-review-by-abbie-jury/ The 'New Zealand Gardener' magazine has three of these books as a "Garden Giveaway" and after reading Abbie Jury's review, giving the book away is most likely the only way the publisher is going to shift this book out of his warehouse. 'New Zealand Gardeners' and for that matter 'All Gardeners' definitely deserve better! 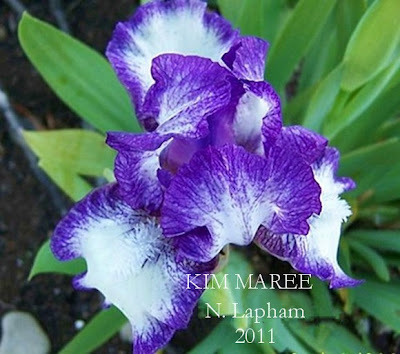 'A Guide to Bearded Irises: Cultivating the Rainbow for Beginners and Enthusiasts' (2012) by Kelly Norris. Reproduction in whole or in part of this article without the expressed written permission of Terry Johnson is strictly prohibited. Another pleasant surprise this bloom season! This iris colouration reminds me of the Intermediate Iris 'Confederate Soldier' both are an odd concoction of colours, but find the right place in the the garden for them to grow and they turn out to be winners. 'Smokey Babe' is a good grower but does have a little trouble getting all its bloom stalks above the foliage in its first year, although I have been informed that it sets itself right in its second year of growing. As you can see it's a smoky lavender plicata,with upright and open standards, moderately ruffled falls and a mysterious but sweet fragrance. Beards are white tipped blue lavender and are certainly a stand-out feature. 'Smokey Babe' has been bred by the late Mrs. Lynette Black who also registered two other Standard Dwarf Irises, 'Plum's & Custard' (registered at the same time as 'Smokey Babe') and 'Kiwi Lass'. Mrs. Black who lived in Heriot a small settlement in West Otago was a Test Garden Director for the NZIS from 1992 until 2000. Now I know where I can purchase 'Kiwi Lass' but as for 'Plum's & Custard' who knows? anyone reading this that does know, drop me a line. This was one of a few Irises I was more than just a wee bit dubious about purchasing and then having to grow this iris at home, the reason for my apprehension, well you would have needed to see the photo used to sell this iris on Trade me was pretty bloody awful, OK lets not beat about the bush the photo was appalling and frankly if the Iris bloomed at home looking like the trade me photo it would of been on the compost heap already. I made the decision to purchase knowing that most New Zealand hybridisers have a good eye, also very few people I assume would register an iris that looked as bad as the Trade Me photo and as you can see my good faith paid dividends! Can someone inform me why does anyone want to make a Standard Dwarf Bearded Iris look like an out of focus Three Prong Frizbee on acid?? 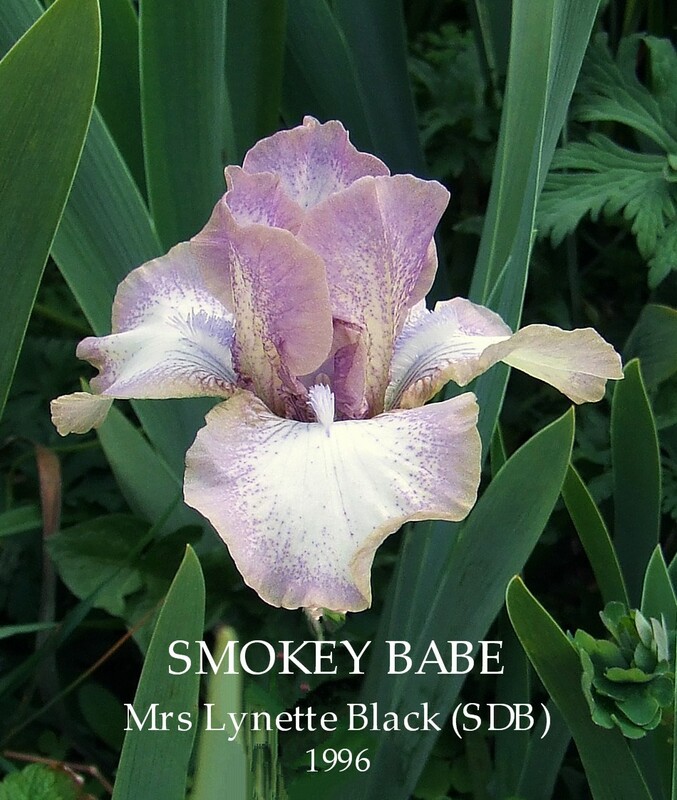 As 'Smokey Babe' and several other irises from the same supplier showed once they started growing that they where shipped with fungal infections (I assume as a bonus for no extra cost) they where all subjected to a rigorous spray programme with a systemic fungicide (Taratek 5F) and this also could have had an affect on the bloom height. Its sad that some clueless commercial growers of irises in New Zealand can't be bothered having a robust spray programme for fungal infections like leaf spot and think it is OK to send you infected plants, but they also want to charge a premium price for doing so. If you do nothing its rapidly becomes like a leaf spot chain letter. The solution? just don't purchase irises from these growers again but make sure you write to them and let them know your displeasure. I do! And they sure as hell don't make it to the New Zealand Iris Growers link list above. If you know 'Cherry Garden' the SDB then you will be familiar with the colour of 'Soundz of Counties' but that's where the familiarities finish. This Border Bearded Iris has branching (if you can call it that) far to close to the stalk, the flowers open touching the stalk and the blooms have crowded each other which never is a good look, and this is exactly what the photo shows one flower on top of the other. We all have the right to ask more of a new iris than just "new and introducing this season". "Branching sufficient to display adequately the blooms according to their size, and height of stem to give balance to the flower, are also essential virtues. Beauty of form, substance, and colour are lost, if the branching is not sufficiently wide to display each flower separately. I have seen lovely seedlings, the first flowers of which looked perfect, but the branching was so poor that the succeeding flowers ruined the whole effect. Very short branching will mean that individual flowers will crowd each other out on the main stem until form and balance are lost in overlapping petals and a splash of colour". 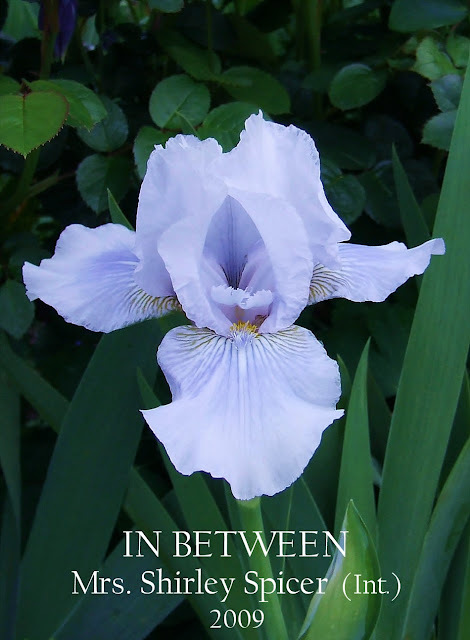 Jean Stevens, Iris and its Culture, Part One, 'On Breeding Bearded Irises'. I will give this iris the benefit of the doubt and grow it on for another season to see if this poor branching trait decides to grow itself out via maturity, I'll keep you updated. 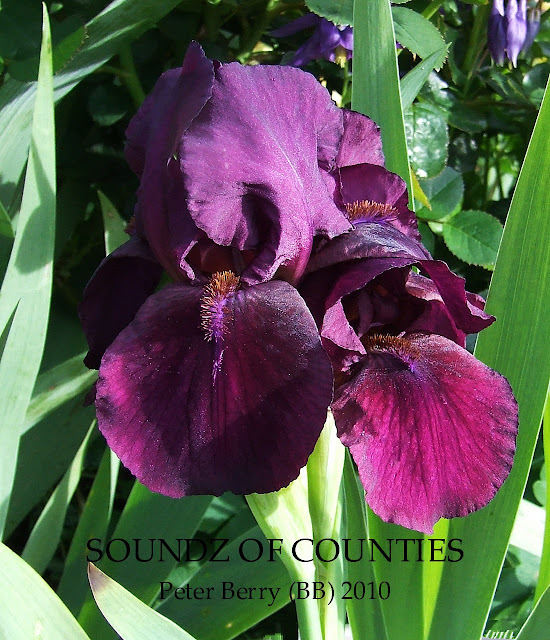 In the meantime should you need a Border Bearded Iris of this colour tone and you don't want to compromise on good form and lets face it you shouldn't have to, go looking for a supplier who has Duane Meek's 'Honky Tonk Hussy'(1991) or Terry Aitken's 'Cranapple' (1995) both are award winning irises with good branching and are available in New Zealand for very reasonable prices. SOUNDZ OF COUNTIES Peter Berry, Reg., 2010. Sdlg. SA 98-6. BB 26" (65 cm), E. S. and style arms maroon; F. same, white lines at haft; beards white base, hairs tipped ginger in throat and middle, white base tipped maroon at end; slight fragrance. Cascade Pass X Cherry Garden. Limavady Irises 2011. 'Forest Glade' has been blooming its socks off at home and shows no signs of stopping just yet. It produces beautiful two buds per stalk with consistency no matter what the weather conditions throw at it. Strong vigorous growth with hearty clean foliage, all of the great plant habits that we have come to expect from a Jean Stevens introduction. 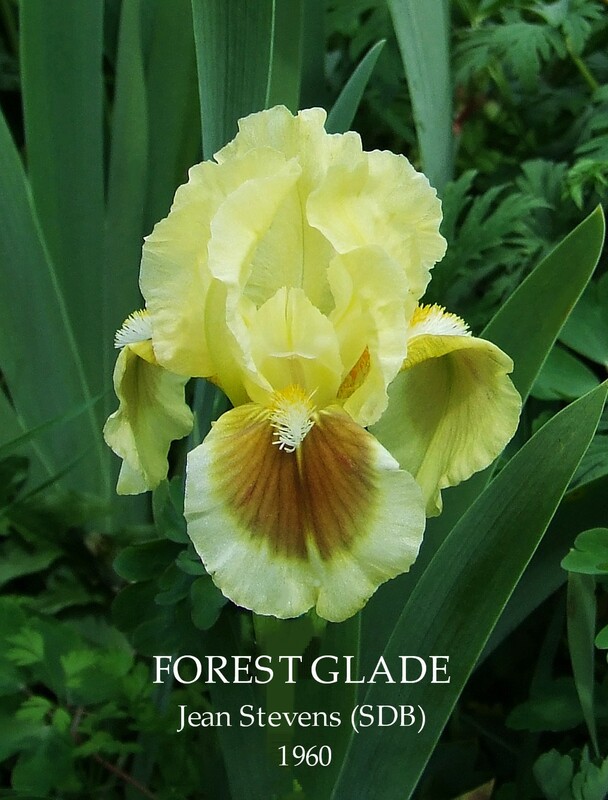 As an aside, the pollen parent of 'Forest Glade's' is an iris named 'Sulina' and has its own interesting history. It's a 3 inch deep violet seedling pumila, one of two (Carpathia was the other) grown and selected from a collection of seeds Robert Schreiner obtained from the University of Cluj in the Provence of Transylvania. Considered by Robert Schreiner to be a lower Danubian form of the pumila species, 'Sulina' and 'Carpathia' are named after one of the three channels that carry the river Danube to the Black Sea. Another of Robert Schreiners famous dwarf breeding irises was named 'Nana' this variety is a collected form of pumila, grown from seed sent from the Crimea. 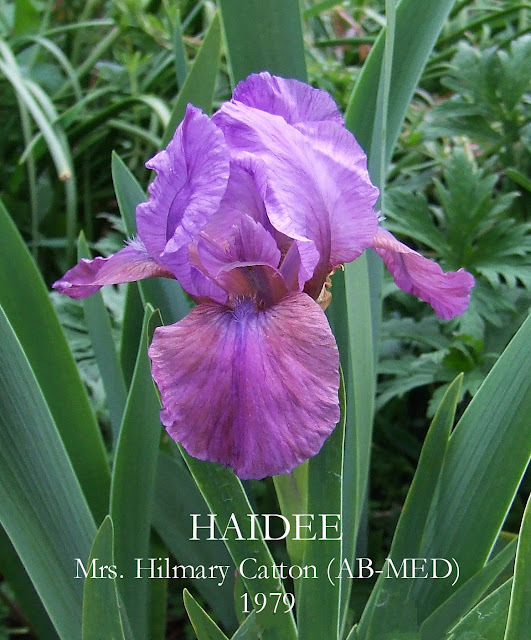 All three of these irises were never registered but were introduced by Schreiners and all were used extensively by many hybridisers and are noted in the parentage of more than just a few MDB, SDB, and Intermediate Irises. THE IRIS (Australia) 1962, 'Comments from Tasmania', Page 70, Marion Calvert. Forest Glade. One of the lilliputs (raised by Stevens of N.Z.). Standards palest citron yellow, while the falls are a clean olive brown with a wide margin of the same citron cream as the standards. It is very attractive in the garden and much admired by all who have seen it. A.I.S. Bulletin #184, January,1967, 'Varietal Comments, Region 3', Page 61,Charlotte Ganz. A very striking flower with lemon standards and olive reddish falls edged lemon. It achieved more height here than it had "Down Under" but still was not in proportion, a failing of which Mrs Stevens is aware. It is a pity because the colors are so lovely. Waterson Iris Gardens were the first to introduce 'Forest Glade' in 1960 the same year of its registration not Sunnyside Gardens, 1969/70, as shown in the official AIS Checklist description . I think 'Forest Glade' is still commercially grown in New Zealand somewhere, but I purchased mine on Trade Me from hctnz (Lyn Nell) a Mid-Canterbury gardener who sends generous plants that have great plant health and who I have no hesitation to recommend highly. 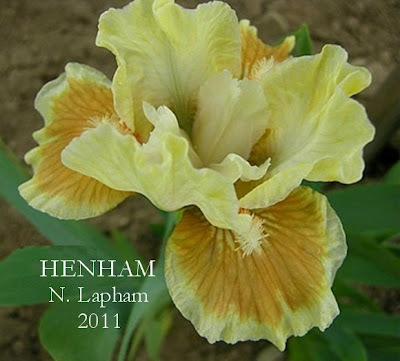 'Henham' Noel tells me is a good growing iris. Named after grandson Henry & used part of surname. Standards light yellow, lighter towards center; style arms white, slight lemon midrib; Falls, yellow-brown, light yellow rim; beards white, orange tips,paler at end. Zero X Yippy Skippy. 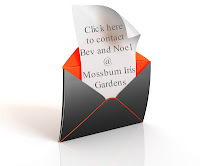 A 'Huge Hat tip' to Bev and Noel for the use of their photo. Send them an email and get their catalogue, you will be surprised the selection available. Photo Copyright and Credit Mossburn Iris Gardens. More of the New Zealand Bred Standard Dwarf Bearded Irises hybridised by Noel Lapham as promised and available for sale this year from Mossburn Iris Gardens. 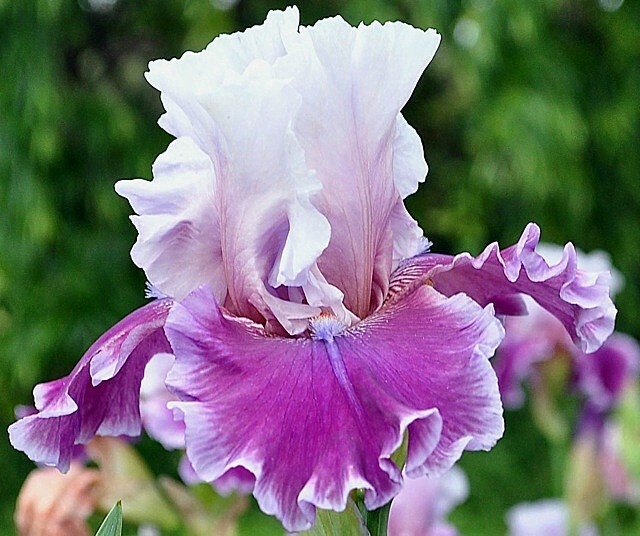 Noel has explained 'This iris lucky to be registered after growing it for eleven years, "SAY SO" is an interesting colour, with striking white beards'. Standards dark blue violet; Falls dark blue violet, cream at hafts; beards white, tipped yellow in throat. Parentage unknown. Mossburn Iris Garden 2011. Once again a 'Huge Hat tip' to Bev and Noel for the use of their photo. 'IN BETWEEN' is out of a cross of Shirley Spicer's 1996 SDB 'Little Bridget' and Gordon Plough's 1976 Blue TB 'Glacier Magic'. Robust growth with nice clean foliage, blooms have good form with strong fluted standards, flaring and lightly ruffled falls and the colouration that reminds me of a indecisive modern version of the great Intermediate Bearded classic, 'June Prom', A. Brown 1966. Standards are solid icy pale blue with no markings, the falls are one shade lighter, smartly deepening to a medium blue towards the falls centre, this is overlaid with deeper toned subtle violet blue striations that change to a heavier concentration of Olive coloured markings at the shoulders, just like 'June Prom' did. A pleasant but not overpowering fragrance and soft violet beard tipped light orange yellow darkening down the throat. Blooms are the ideal size for an intermediate and on rather strong , well-branched stalks. Works for me! IN BETWEEN Shirley Spicer, R. 2009. Sdlg. SS/17/90. 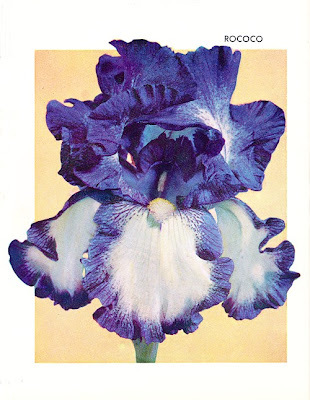 IB, 38-42" (97-107 cm), E ; S. pale blue; F. pale blue flushed deeper blue, greenish striations on hafts; beards pale violet hairs tipped yellow; slight sweet fragrance. Little Bridget X Glacier Magic. Tucked away in Masterton’s Queen Elizabeth Park is a little iris garden, originally established by money donated by the Wallis family and named in their honour. Bert and Nance Wallis were keen irisarians and founder members of the New Zealand Iris Society (NZIS) in the late 1940s. Bert loved Tall Beardeds – the taller and brighter the better – while Nance preferred smaller bearded and species irises. They passed their love of irises onto their family – son-in-law Ron Isles was President of the NZIS and grandson Gareth Winter is the current editor of the Almanac of the Society for Pacific Coast Native Iris. Gareth, who breeds PCIs in Masterton, has donated some of his seedlings to his grandparents’ garden, and I recently went down to have a look and see what was flowering. This exceptional blue variety took my eye, and I couldn’t help but think of 'The Mamas & the Papas' song, “Californian Dreamin”, partly because the next line is ‘on such a Winter’s day’! I sent Gareth a copy of the photograph and he went over to the park to see the flowers himself, but before he got there a thief in the night had beaten him, and all the flowers had been picked and taken away. While we admire their extreme good taste in stealing the iris flowers we think they should have been left there for the rest of the public to enjoy. I am quite partial to Blue and White coloured plicata's in the Lilliput's as they add a special carrying power to the emerging spring garden. Noel Lapham thinks that there are a lot of iris with this colouring but this one is a brighter colour. Obviously a Lapham family favourite as 'Kim Maree' was selected by their daughter, and has been named after her. Standards white ground, dark violet rim; style arms violet, lighter edge; Falls, white ground, violet rim and hafts; beards white, yellow tips in throat. Chubby Cheeks X Crispin Babe. A 'Huge Hat tip' to Bev and Noel for the use of their photo. New Zealand Bred and classified as a Arilbred Median (AB-MED), it also has the classification from the Aril Society as OGB- which is a a hybrid containing any combination of oncocyclus and regelia and other eupogon irises. To simplify things this iris at 14 inches has the same height requirements as a Standard Dwarf Bearded Iris to give you an idea of size, it just has different mix of iris genetics. 'Haidee' blooms have striking and vibrant rose lavender standards and falls of a darker rose lavender tone. Small lighter violet highlights around a deeper violet beard. Growth is less than average but I am sure this is one of those irises that I will have to find the right spot to grow in order for it to be a success. Difficult to bred with because of its varied chromosome count derived from its parentage. 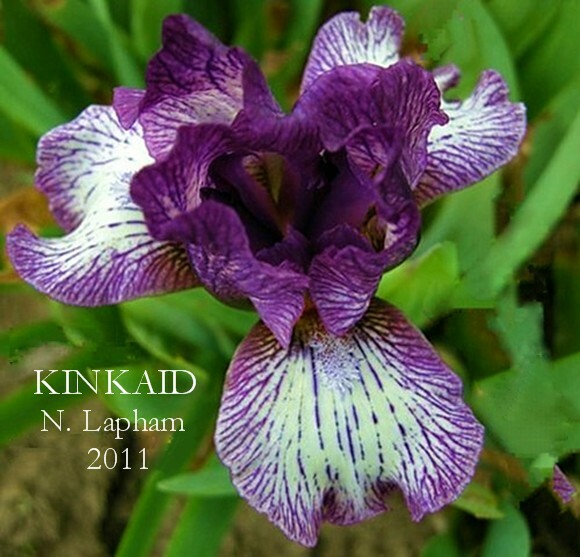 I purchased this iris last year from Richmond Iris Gardens but it has not been listed this season, so maybe next year. 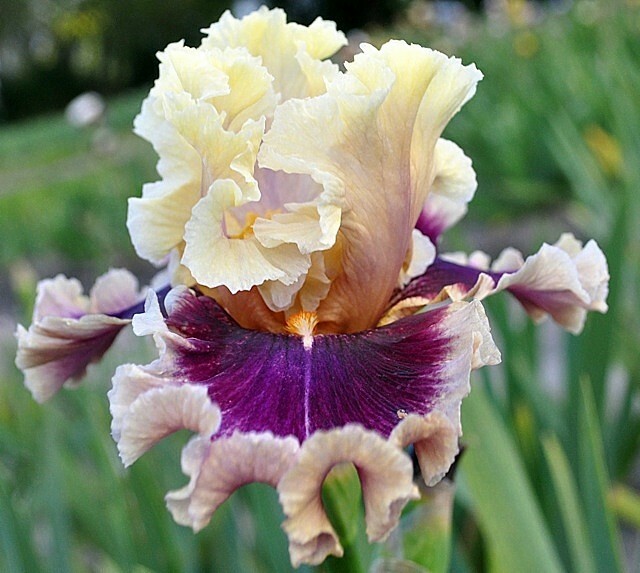 Over the next week or so I have the privilege to feature 4 more New Zealand Bred Standard Dwarf Bearded Irises hybridised by Noel Lapham and available for sale this year from Mossburn Iris Gardens. KINKAID Noel Lapham, Reg. 2011 Sdlg. 07-11/1. SDB, 11" (28 cm), E. Standards, dark violet, light lemon ground; style arms light violet, deeper midrib; Falls, white ground, dark violet rim and veins; beards white, tipped purple at end, deep yellow in throat. Chubby Cheeks X Lore. Mossburn Iris Garden 2011. The Tempo Two web site has now been updated with all of the photos of his new 2012 Introductions. 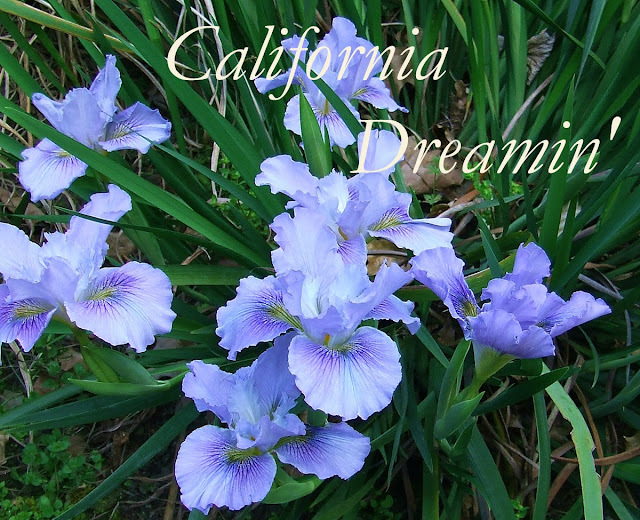 (Yes folks there are more than three outstanding irises introduced by Barry each season.) 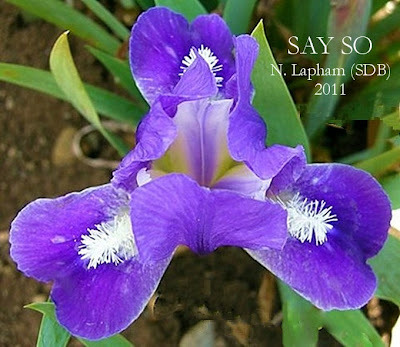 Mr. Blyth the generous chap that he is sent these three photo's of his new introductions to share with you all as a preview to the release of one of the finest kaleidoscopes of sensational new Irises for 2012. Checklist descriptions for these varieties are listed at the bottom of this page. Tempo Two gardens will be open to visitors on 3 weekends starting 20th October, 2012 and will have a display in their barn of some of the newer named iris for closer comparison to each other, or if you like you can wander the rows and see how they grow. You would have to think it would be a safe bet that 'DECADENCE' is in the parentage somewhere!! AVENUE OF DREAMS Barry Blyth, Reg. 2009. Seedling Q98-1. TB, 40", (102 cm), Early-mid-late bloom season. Standards opalescent creamy pink becoming opalescent lavender-pink at midrib; falls light rosy magenta, 1/8" edge of soft pinkish lilac; beards tangerine in throat, soft blue-lilac at end; pronounced sweet fragrance. N211-5, Art at Dawn sib, X O21-1: (Paris Fashion x H165-9, Aflutter sib). Tempo Two 2112/2013. IN HIGH HEELS Barry Blyth, reg. 2012. Sdlg No. S216-1, TB, M 34", (Sweet Svengali X (0166-A: (M39-1: (Excuse Me Darling x Mayfair Mistress sib) x Chocolates and Silk sib) x Dinner Talk)). Tempo Two 2012/2013. MAKE MINE MAGIC Barry Blyth, reg. 2012. Sdlg No. S299-1, TB, EM 34", 0248-1: (Winsome Dancer sib x (L285-1: Paint The Scene x Dreamlord) x Ocelot) X Another Woman. Tempo Two 2012/2013.